Buy Gold: Gold Price UP or currency DOWN? Every man and his goldfish is offering predictions on how much the gold price is going to go UP in the coming year. Lets take a new look. Let’s look at how much currency is going to go DOWN in the coming year. For the gold price, in fact, does not change at all. If one could simply go out and buy goods and services with gold instead of paper money, one would use the same amount of gold to buy goods and services as one did say … fifty or a hundred years ago. The amount or quantity of gold one uses to buy the same goods and services has not changed. The same cannot be said for paper currency. Gold is not an investment that earns interest. The only way you can get interest on the basis of gold is buying some stock or shares in a gold mining company and getting a dividend each year based on the type and quantity of stocks or shares one has. For most people these days, buying gold and keeping it is based on the premise that it will be worth more later down the track than it was when it was bought. A reasonable assumption one might say. But while the actual value, in terms of goods and services, does not change; or if it does it is a very slight change, what it DOES do is preserve the value when the generally agreed upon currency for the society in which you reside changes. So the questions then becomes how much paper currency can I get if I sell my gold down the track? Historically the more money is printed, sorry … the more Quantative Easing is implemented, the less value there is of the existing money. This means the more of it is needed in order to purchase any goods and services than before the money supply was increased. Simple to understand which makes one wonder why it is done. 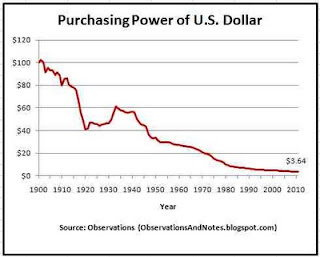 Anyway the value of the US dollar, by way of example, has decreased over the past as can be seen in the graph above. Since 1900 to the present day the value of 100 dollars has decreased down to 3.64 in 2010. Gold, on the other hand has not. If you purchased 3 ounces of gold in 1900 at 35 dollars an ounce, today those three ounces it would be worth on the order of around 4800 dollars. NOT because the gold has gone up but because the dollar has gone down. So anyone buying and owning gold for any appreciable time is going to be a winner by default, as it were, as they are not buying currency that is going to depreciate in purchasing power over the duration. To buy gold then is a matter of self defense for someone who wishes to preserve their wealth, or even some savings, not matter how big or small. Unless a miracle happens, it is almost a certainty that the value of currency is going to continue to depreciate and it is going to continually take more and more currency just to buy the basic necessities of life it is in anyone’s self interest to buy gold and keep it just to preserve some savings. The lesson then is to, buy gold and preserve what you have for the future without letting it erode away!